Beautiful home, in a beautiful location. Wonderful location, able to walk to town, which was fun. It was so great to be so close to the water, you could heard the waves hitting the shore day and night, so soothing. The furnishings were very comfortable. The only thing we wish that would have been supplied was basics like cooking oil and napkins, which are usually provided. And, there was only one casserole dish and only one wine glass. Overall, it was very relaxing and an enjoyable visit. I have been staying here since I was a little girl and it is a rare gem that never changes and always feels like home! The only thing I would suggest is getting more kitchen cookware for the unit. We had to buy a some items at the local store in order to make dinner in the oven. Excellent stay! Clean and great location! The location, views and layout of the home were absolutely incredible! The kitchen was awesome, large, well organized and functional. Problem: the beds were very hard and some areas of the home were not very clean. 10am Check out was too early for such a large house. The man at the service counter was outstanding. Helpful and friendly. Loved our unit. Stayed there before in 2014 Already referred your place to a friend. The home was warm and comfortable. Sizes of all the rooms were great. Enjoyed the porch room. Everything was very clean. Beds were great along with the furniture in the living area. There was nothing that we found that we did not care for. I loved the condo! Views were amazing! We really liked the balcony area. Everything was nice, clean, and well stocked. Beds were comfortable. The caretakers there were very nice and friendly. 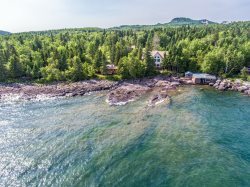 I also liked the location - close to parks, biking trail, and short drive to Grand Marais. Liked location for close to the Lake and Hiking Trails. Some road noise at night not so good. Nice beach access. Liked floor plan. Kitchen is well stocked. Upstairs living room furniture not very comfortable. We would rent this unit again. It was cozy and had everything we needed! The location is great. The deck is wonderful with amazing views. Great fire pit and lake access. Large yard surrounding the house makes it very private. All wood floors makes it pet-friendly. Close to Split Rock, Gooseberry Falls and lots of great restaurants. Very well appointed cabin. Great kitchen, lovely dining area, comfortable living room all with a view of the lake. There is great ledge rock if you like to take a challenging walk. It also provides soothing sound if you like listening to waves hitting the shore. The home was great. it worked out perfectly for us. The only change I would suggest is a bit of soft seating in the dining room / kitchen floor. Since the bulk of our time in the home revolved around meals, we wanted to hang out on that floor more than the others. The rooms were nice size and easily accommodated our group. Enough comfortable furniture in the living room for us all to gather and relax as well. Beds were very comfortable. House was well maintained. Yard was beautiful. Suggestions for improvement would include a fire pit in the yard. There is plenty of space and plenty of chairs. This would be a relatively inexpensive addition that would improve the overall outdoor experience. It would also be helpful for longer stays to be able to use the washer and dryer. Location was excellent right on the water and centrally located around town(s) and amenities. The home was nicely equipped and clearly set up nicely for any type of vacation. Great private spot! Great location. Very comfortable in every way. We'll definitely go there again. Loved the homey and personal touches and family and cabin history. The cabin was perfectly tiny. Just the cozy space that we were looking for. I liked almost everything, the bed was too soft and you could feel every move your partner, this would wake you up ever time they move. Kitchen and living room and cleaning was five star.